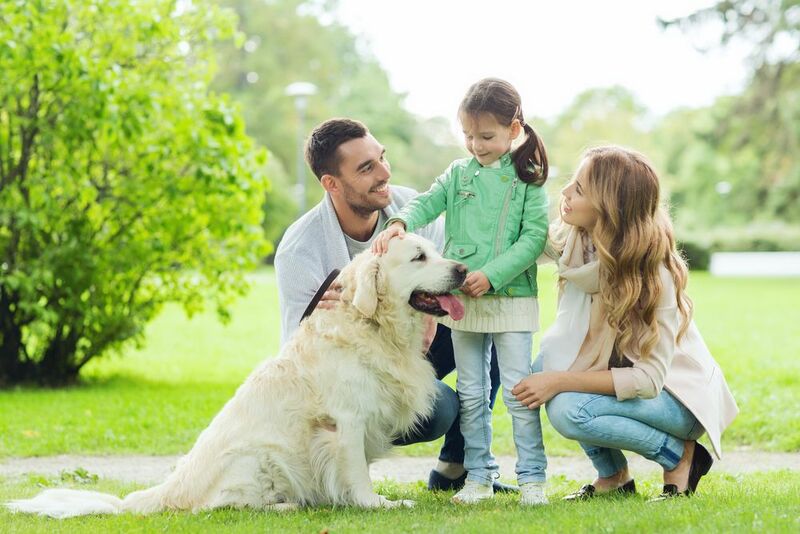 Many people worry about the combination of young children and dogs in the same household, but with a managed introduction and careful supervision, there is no reason why having children should be a barrier to canine ownership. In fact, when the time is taken to introduce dogs and kids to one another properly, strong bonds and lifelong friendships can be formed between your furry friend and the youngest members of your household. By allowing your canine companion to get used to different people you will also be supporting his socialization skills. Your dog will quickly learn that most humans are friendly, gentle creatures who pose no threat to them, which will prevent your pooch from feeling anxious, overwhelmed or scared. We recommend that you introduce your dog to your children and other people as soon as possible after they enter your life. This will help him settle quickly into becoming a calm, relaxed and happy member of your family. Unfortunately, many people still subscribe to the belief that throwing both your dog and your child straight into an unfamiliar situation is the best way to overcome any fears or anxiety they may have. Unsurprisingly, this is far from true. Even if your dog has been exposed to children in the past, there is no guarantee that he will happily accept your own, and thrusting him into the arms of your waiting kids will only trigger his defences and make him more likely to become irritable or aggressive. The single most important thing that you can do is to let your dog introduce himself to your kids rather than vice versa. This puts your pooch firmly in control of the situation and gives him the space to back away if he feels confused or threatened in any way, rather than needing to lash out to ‘escape’. Start by asking your children to sit quietly on the floor on the other side of the room. This provides your dog with the opportunity to put plenty of distance between himself your kids if he becomes overwhelmed. Your children can then encourage your dog to approach them by beckoning, or offering treats. If your dog approaches them, they should reach out slowly and gently and pet under his chin rather than the top of his head. This way your dog can see exactly where he is going to be touched. Do not let your kids touch his tail or back, and they should not hug or squeeze your dog. Once the initial introduction has been made, get your kids to give your dog some space so that he can process what has just happened. When you are ready you can repeat the process, increasing the amount of time that your children and dog are together or reducing the distance between them when you start. It may take some time and patience, but eventually, regular, controlled exposure to one another will allow both your kids and your dog to trust one another. Don’t forget that each time they are introduced to one another, you must pay close attention to make sure that neither your pet or your children exhibit any undesirable behavioral traits that could incite a negative reaction from the other party. Keep your children as quiet and calm as possible. Dogs can sense the atmosphere around people, and will react in the same way. A fidgety, loud child may cause your furbaby to become distressed and act out. Teach your children to respect your pet. It is essential that kids are taught that their new canine pal is not a toy and he should be treated with love, care and respect. Don’t allow your kids to tease your dog. This could include calling his name and then running away, or holding out a treat and snatching it away. This will just confuse and frustrate your dog, causing him to become agitated and even aggressive. Teach your children to increase their contact with your dog gradually, so that they both have time to get used to the behavior and reactions of one another. Never leave your dog alone with your child until they have spent a long time getting to know one another. Ensure there have been no incidents of snapping or aggression, and that your child knows exactly what behavior is and isn’t appropriate with your pet. If you have any concerns about their interactions, do not leave them unsupervised. With time, patience and understanding, your furry four-legged friend will soon be able to settle into life with you and your children. For more information and sound advice about your furry friends, contact and make an appointment with our veterinarian.